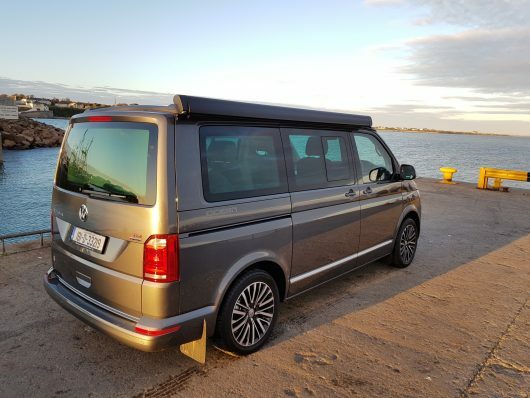 My last foray with Volkswagen’s slick California was in the summer of 2015. 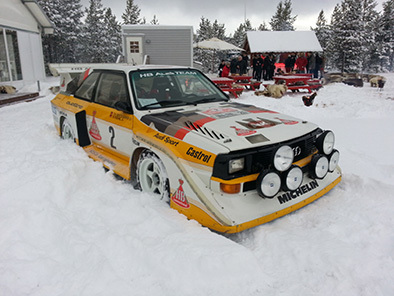 We headed off motor racing for the weekend in Northern Ireland, where the California became our base for the weekend. It excelled at providing the team’s much-needed hearty breakfasts, countless cups of coffee and team strategy meetings, as well as providing a comfortable night’s sleep for 3 adults. 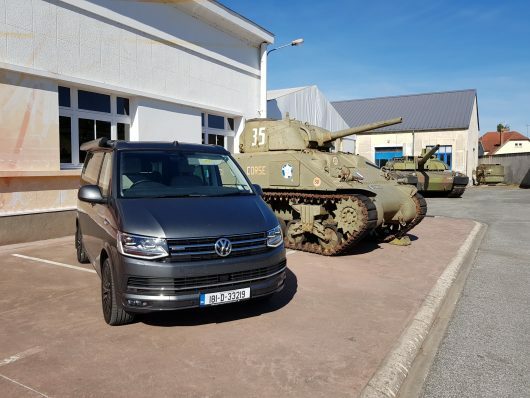 After spending the weekend on four wheels, I was somewhat surprised at how much we gelled with the California, a modern variant of the original air-cooled Volkswagen Camper. When the opportunity arose to spend ten days travelling abroad in the California, I didn’t need to think long about where to go. 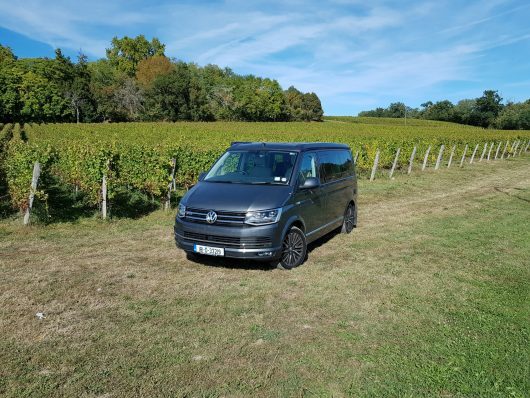 The summer holidays were planned for myself and my wife to travel around France and the picturesque Bordeaux region along the Dordogne river. Travelling with Irish Ferries from Rosslare to Cherbourg on the Oscar Wilde is now by far my recommended way to travel on holiday. The advantage of having no luggage restrictions and avoiding lengthy queues at the airport takes all the stress out of travelling. The ferry journey is part of the holiday, the service on board is excellent, with the addition of a new ferry to the fleet for 2019, the W.B. Yeats will provide cruise-like facilities and entertainment. 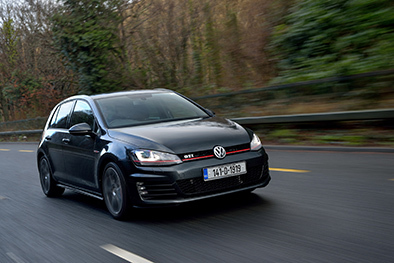 Our California is the high-end Ocean model, powered by a 2.0-litre turbo diesel engine producing 204 horsepower, mated to a seven-speed dsg automatic transmission. 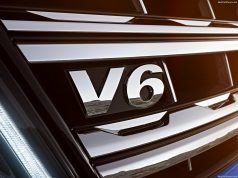 It also benefited from Volkswagen’s 4Motion all-wheel-drive, reassuring for beach trips and parking on soft ground at the campsite. We spent most of our time driving along national roads to take full advantage of France’s picturesque countryside. 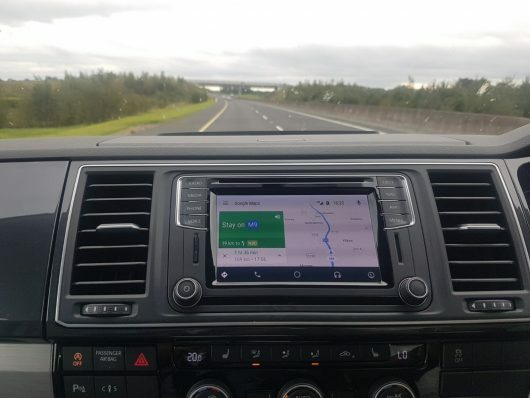 For all our routes we used Google maps through Android Auto which takes all the stress out of map reading, it’s live traffic updates is excellent, and we managed not to take any incorrect turns over our 2,500-kilometre trip. 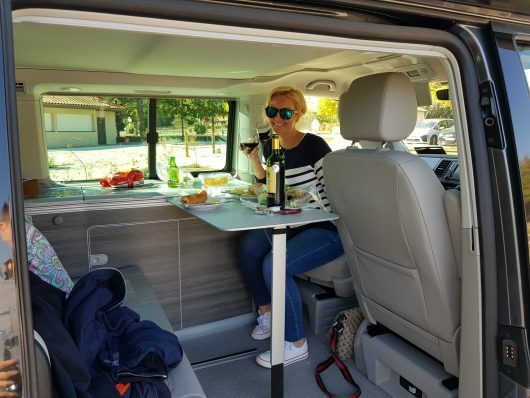 The California is extremely comfortable and capable over long distances, we often took a coffee break in small villages where we could park easily and make fresh coffee and lunch within minutes. The onboard fridge is surprisingly cavernous swallowing up plenty of food and drinks. Once at your chosen campsite it doesn’t take long to setup for the night. The California Ocean is extremely well equipped, with clever storage compartments throughout. 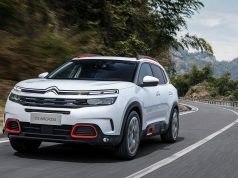 All the campsites provide an electrical power point to connect with a 230-volt socket at the rear of the California, saving the California’s batteries. 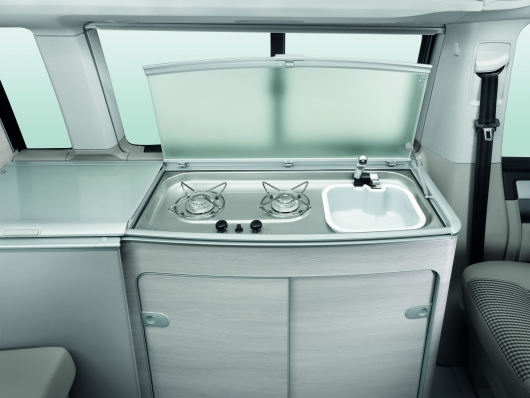 There are two built-in water tanks, one for fresh water and one for waste water when using the sink. There is a two-ring gas cooker which is more than capable of cooking up a meal in the evening for when you don’t wish to venture into town. When it’s time to rest your head, the electrically-operated roof rises at the push of a button to reveal a double bed. Getting up and down to bed requires a bit athleticism, but once up, it’s a tranquil place to sleep. There are power points and lights too. 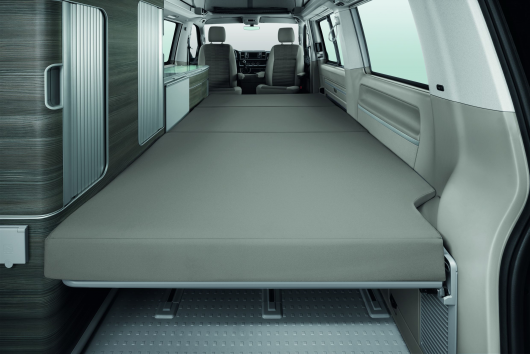 You can also transform the rear seats into a double bed, the front driver and passenger seats rotate 180 degrees, so four adults can sit facing each other. The interior of the side sliding door cleverly houses a table, with two deck chairs tucked inside the rear hatch. 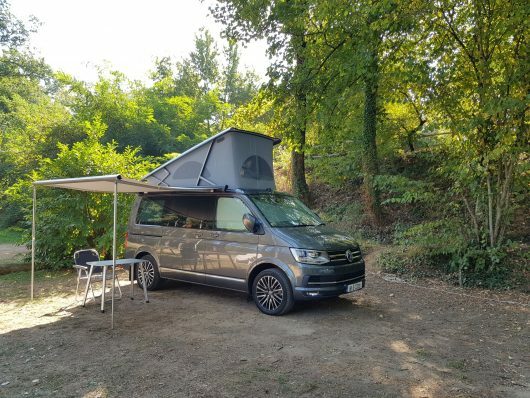 There’s a lot of thought gone into the layout and design of the California, there is even a shower at the rear for washing down outside after a swim at the beach. 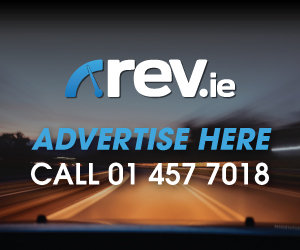 All this quality comes at a price, our test model California Ocean costs €82,622. For this amount you could have a larger camper, complete with a bathroom, the only thing missing from the California. 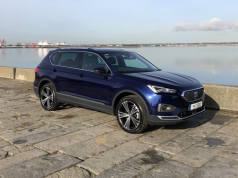 However, one of the main advantages to the California is its size, it’s not daunting to drive and is easy to park in regular car parking spaces. 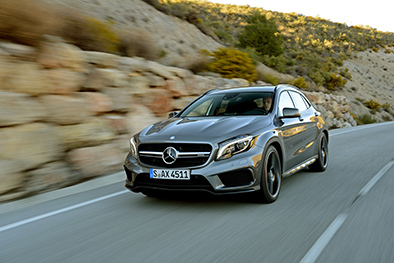 It cruises at motorway speeds, kilometres pass by in sheer comfort. 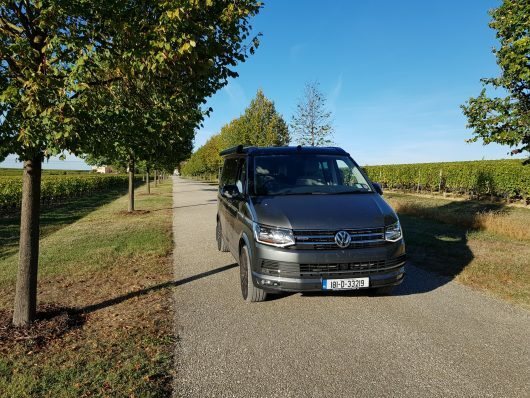 Taking a holiday in the Volkswagen California allows you the freedom to travel at your leisure and visit places you may not otherwise see. There’s also the benefit of having an abundance of luggage space for any holiday purchases. Now to plan our next adventure in a California.